This last week we drove down to El Paso, Texas, for the New Mexico Native Plant Society annual meeting. Yes, El Paso is in Texas, although there are many who wish it were in New Mexico: many of the residents of the city as well as many Texas politicians. El Paso is in the same time zone as New Mexico, an hour out of sync with almost all of Texas, and the population is decidedly different from those of Dallas and Houston. On top of that, it’s over five hundred miles from El Paso to Houston and San Antonio, and only thirty miles to the New Mexico border and a little over two hundred miles to Albuquerque. But the main reasons that El Paso is part of the New Mexico Native Plant Society is that the ecology (read desert) of El Paso is similar to much of New Mexico; both are on the edges of the Chihuahuan Desert and so the plants are very similar, unlike the live oaks and Spanish moss of East Texas. We lived in El Paso for a number of years, so the meeting was an opportunity for us to renew old friendships, visit our old neighborhood, and enjoy some of the good regional food of the Border. Susan went to meetings while I drove around old haunts and took naps, but both of us took time out to eat at two of our old-time favorites, the Little Diner in Canutillo, Texas, and the H & H Car Wash & Coffee Shop in downtown El Paso. We ate at a trendy new restaurant in the refurbished warehouse district. We didn’t much like it, so it will go nameless. But we also enjoyed drinks and snacks in the Liquids Bar in our hotel, a wonderfully revnovated derelict of a hotel that had sat vacant for many years after having a moment of glory in the distant past when Elvis Presley performed there. Here are a few images of native plants from New Mexico that you might enjoy. The Little Diner is a local institution. It is extremely hard to find in a residential area of the little town of Canutillo. It sits right next to a coin laundry, so you can do your washing while you are having lunch. Unfortunately, the original owner has died, and her daughter now runs the place. Some of our El Paso friends reported that it had gone down hill, but we had a great experience. The specialty of the house is gorditas, fat little masa pillows deep-fried, slit open, and stuffed with seasoned beef, cheese, tomatoes, and lettuce. You add the salsa to your liking. They are so unlike the pale copies sold at Taco Bell that you wonder how they share the name. They come three to a plate with beans and a salad, so even a big man should not go away hungry. To my knowledge, gorditas are fairly localized to this part of the border. I have never seen them on Tex-Mex menus in the rest of Texas, and they are not a part of the cuisine around Santa Fe. H & H Car Wash is legendary. It was awarded the 2001 James Beard Award for American Classics. Not bad for a hole-in-the wall with a counter and about 10 stools along with two booths. Never mind that you can get your car washed and filled with gas and also get your shoes polished while you wait your turn for jumping on one of those stools. The day we visited, there were heavy rains, decidedly unusual for El Paso (It’s in the desert, remember?) So the car wash didn’t have much business, and as a result the coffee shop was also not crowded. Being able to speak Spanish helps when you order. Actually, many of the staff speak English, but here you are on their turf, and they don’t cut a lot of slack unless it is clear that you need HELP. I ordered what I always order, huevos rancheros. Their version is unique, and I favor my own version, but it is still delicious and, anyway, that’s the reason I came to eat. Susan got the eggs and sausage. Since it was Saturday morning, we could have also gotten a bowl of menudo that was heating in a big pot on the back of the flat-top. We both passed, but that’s another story. 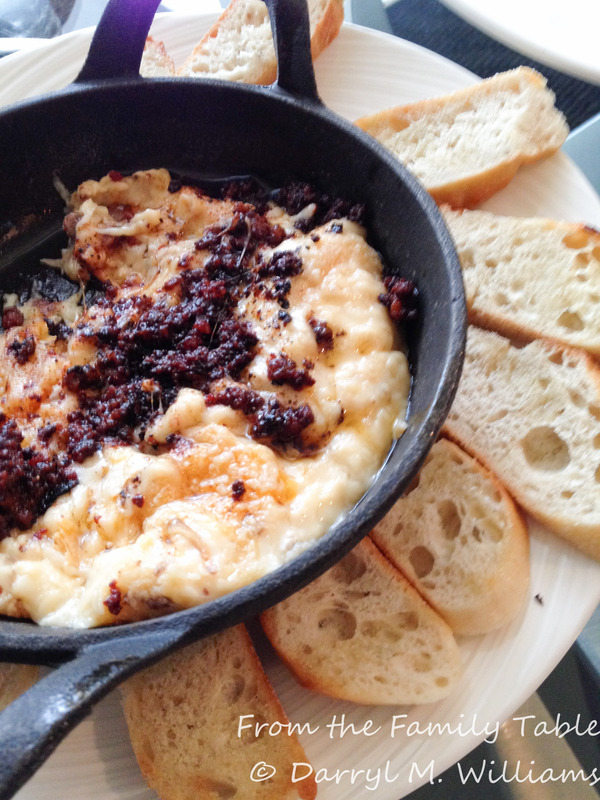 The night we ate at the bar, we ordered queso fundido (“melted cheese”). The first time we ever had that dish was nearly thirty years ago in Tlaquepaque, Mexico. 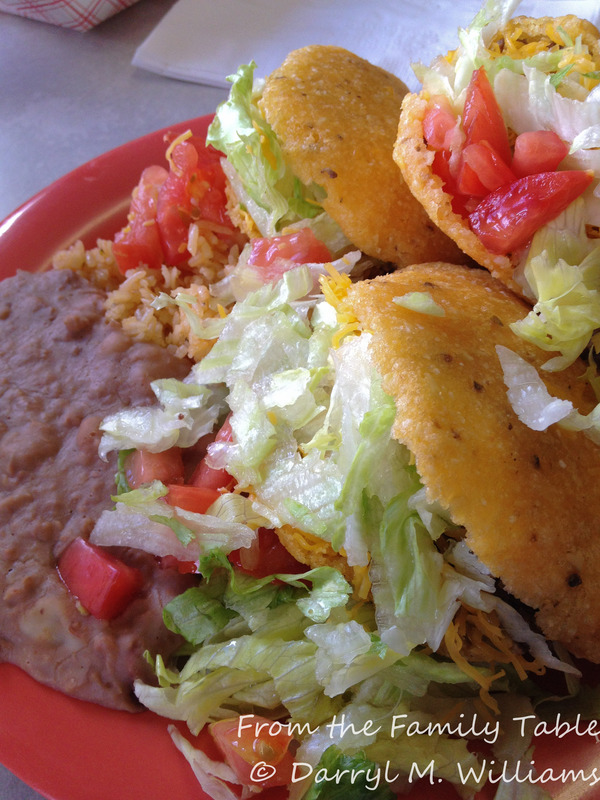 It was so good with freshly made corn tortillas that it has been a favorite of ours ever since. The bar’s version came with crostini, cutting across cultures, but it was delicious. I will give you a recipe in a subsequent post. All in all, we had a great visit, and enjoyed some food that we can’t get locally. I grew up in Texas but never visited El Paso. Just as you said…it is quite a distance from most big cities. It sounds like you had a pleasant return visit. We have lived all over Texas, and each place is unique. It’s nice to be home. Yes, they definitely beat menudo. Looked that up – beef stomach soup!?!? Mmm. On the US-Mexico border, menudo is considered the best cure for hangovers, so it is always on the breakfast menu at restaurants. Never, ever say you have not had menudo you liked because the standard response is, “You’ve never had MY menuco,” and the next day you will get a bowl of their menudo that you will be obliged to eat. I remember that queso fundido. Delicious! Gorditas and carnitas from the El Paso region are the best in the U.S.. Our L.A. versions are not nearly as delicious. Every community has its own benefits.